"Call your Bubbi for the recipe and write everything down," I said to my daughter. It was just before Passover, and were were going to make kneydlekh, matzo balls.In the old days my family made them together, batches and batches, some large, soft and fluffy, some small, round and chewy. The family was split in tastes. Before my time, my mother's mother had inserted a crisp bit of chicken skin, a grivn, in the center of every kneydl. This flavorsome crackling with the dumpling she called neshome, the soul. My daughter calling my mother for the recipe? My mother who approximated her mother's recipe? Her motherless mother who invented her mother's recipe? The ancient and timeless matzo ball? Yes, that's my religion." "Crack open eggs (my daughter wrote). Separate whites from yolks. Beat whites till fluffy. Beat up yolks, add oil and matzo meal. Add salt and pepper. Put in ginger. Fold in egg whites. Add a little cold water - quarter of a cup. Mix it all around. Has to be a batter you can work with. Can't be cement. Can't be mud. Taste it. Must be good raw! Add more seasonings if necessary. If good batter, cover the bowl with plastic wrap. Put in freezer 10 to 20 minutes. Boil either soup or salted water. Have a small bowl ready with cold water and ice cubes. Dip hands in cold water before each kneydl. Form kneydlekh and throw in boiling water. If you want small, hard kneydlekh, add more matzo meal and seasonings. For small ones, form marble-size; for big ones - size of golf ball. (They grow). Cook for 15 minutes. Cut one big one in half and see if ready. (Look and taste). Throw in colander. Let Mom and Dad do this. If want to keep warm, cover." —"The Soul in the Dumpling," from Miriam's Kitchen, by Elizabeth Ehrlich, Penguin Books, New York, 1997. Being Valentine's Day, I thought I'd make quail in rose petal sauce. Quail in Rose Petal Sauce comes from Laura Esquivel's wonderful, wonderful book Like Water for Chocolate. It's an elaborate and passionate recipe with hilarious repercussions at the dinner table. It involves grinding rose petals in a mortar, roasting and pureeing chestnuts, dry-plucking quail, obtaining attar of roses, and running off naked with a Mexican revolutionary. It's delightful to read but I doubt it would be something I would want to eat in real life. Not to mention that I don't know where to procure quail. And I hear that being naked on a horse is highly overrated. My parents recently went to a party where the hosts recreated the great feast from the book Babette's Feast, by Isak Dinesen. This famous meal features another quail dish, "Cailles en Sarcophage." Quail in coffins. It's quail in a puff pastry shell with truffles and fois gras. I found a picture of it on Wikipedia and in my opinion, it's about the most un-romantic thing I've ever seen on a plate. If I could get beyond it looking like poultry suicide, and were inclined to make it, I do currently have the package of puff pastry in my freezer. But I still don't know how or where to get quail. What I did have however, were two cornish hens in the fridge, and Anna Shapiro's terrific book Feast of Words. She has taken the quail dish from Babette's Feast and altered it to a more appealing Quail with Potatoes and Grapes. It sounded delicious and just the kind of special thing I was wanting to make for me and Jeeps. I have transcribed it here instead of in this post because I didn't follow it exactly. Firstly, cornish hens need longer cooking time than quail. Second, I used about half the amount of butter. In an oven-proof skillet, heat olive oil and 2 tablespoons butter over medium heat. Rinse the hens, pat dry, truss if desired (I didn't). Season outside and cavities with salt and pepper. Brown birds in skillet on all sides, finishing breast-side up. Put into oven and set timer for 20 minutes. In another skillet, heat olive oil. Add potato cubes, salt them, turn until coated, and cover. Cook for 20 minutes, shaking the pan and, if necessary, scrape with a wooden spoon. When browned all over, remove heat and keep warm. Take hens out of oven. Add chicken stock and wine to pan, stirring with a wooden spoon and scraping up browned bits from bottom. Add grapes. Return to oven and set timer for 15 minutes. Remove pan and set on stove over medium heat. Cover and let sauce boil for 5 minutes. Move birds to serving dish, add 1 tablespoon butter to sauce and let simmer another 5 minutes. Pour sauce and grapes over hens, serve with potatoes. I made steamed green beans to go along with it. The kids had their heart-shaped pizzas, Jeeps and I tucked into our dish. I was a little nervous, hoping the birds had cooked thoroughly, and if it was horrible then at least there was leftover roast pork. Holy crap, I could not believe how in love I was with this dinner. The hen was cooked perfectly, it was so fun to carve apart this miniature roast chicken, and it was the perfect serving size for me. We ripped this meal apart. Jeeps devoured it to the carcass, stole the kids' pizza crusts to dip in the sauce, and when there was nothing left to dip, he drank the sauce. Not a scrap left. And, best of all, a tiny tiny wishbone to save for a rainy day. I was so happy with tonight's dinner. I've been wanting to try Cornish hens for a while, and I am definitely going to come back to this recipe. I accidentally found a kindred spirit. See, I was drafting a post about nursery supper (never mind, it will make sense later) and surfing doing a bit of online research about this and that...and I stumbled on a blog called Munchkin Mail. Normally I do not click on blogs with names like "Munchkin Mail" but in the Google search results this blog had the magic word combos, "nursery supper," "meal from childhood," "Children's books," and "baked potatoes." I clicked and found an amazing post indeed titled "Nursery Supper" about the author coming home from a trip, needing to make something "comfortingly simple." She decided on a dish known in her house as "Milly Molly Mandy potatoes" because they are based on a meal from a children's book of the same name. They are nothing more than twice-baked potatoes, but the provenance of the potatoes coming from the story just made my heart sing. It embodied everything I strive for in an eats-reads connection, and it was exactly the kind of Nursery Supper example I was looking for. Not only did I make the potatoes tonight, but put the book on hold at the library because I simply have to read it now. Lid potatoes, Milly-Molly-Mandy Potatoes...whatever you call them, they are super easy and super fun. You bake your potatoes according to your method (I scrubbed mine, poked holes, threw them in a 400 oven for 45 minutes). Then you cut a small slice off one short end so that it will stand up on the plate. Cut a larger slice off the other end, this is the lid. Hold the potato in an oven-mitted hand, then, with a spoon, carefully scoop out the insides into a bowl. Careful not to carve in too deep or you'll poke out the other side (which is not a tragedy). Mash up the potatoes with butter, salt, pepper and cheese of your liking—grated parmesan, shredded cheddar or jack—and then spoon it back into the shells. Put lid on top. Serve with a spoon. Kids go crazy for this. I mean, it's mashed potatoes, duh, but the added novelty of scooping it out of the potato standing on its end? Too much. If your ego needs stroking, I suggest making these because you will rock. 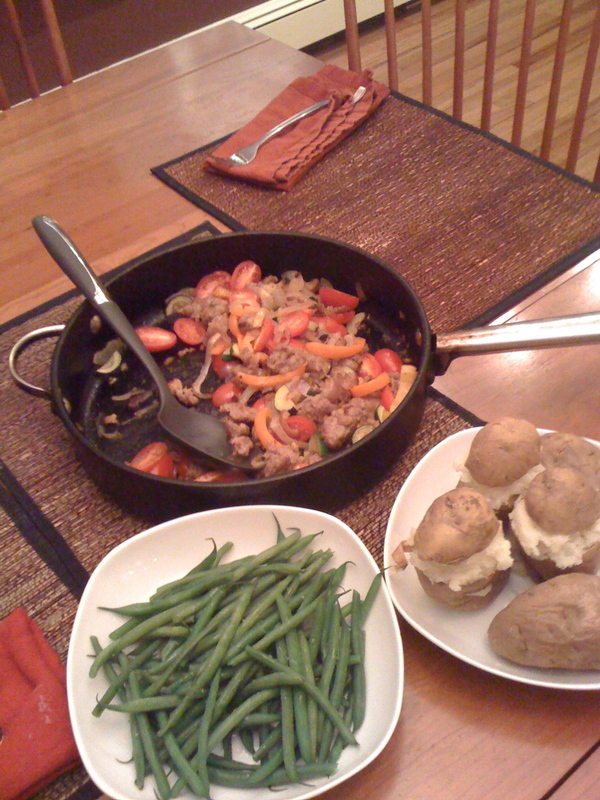 I also made steamed green beans and sauteed Italian sausage with peppers, onions, zucchini and grape tomatoes.